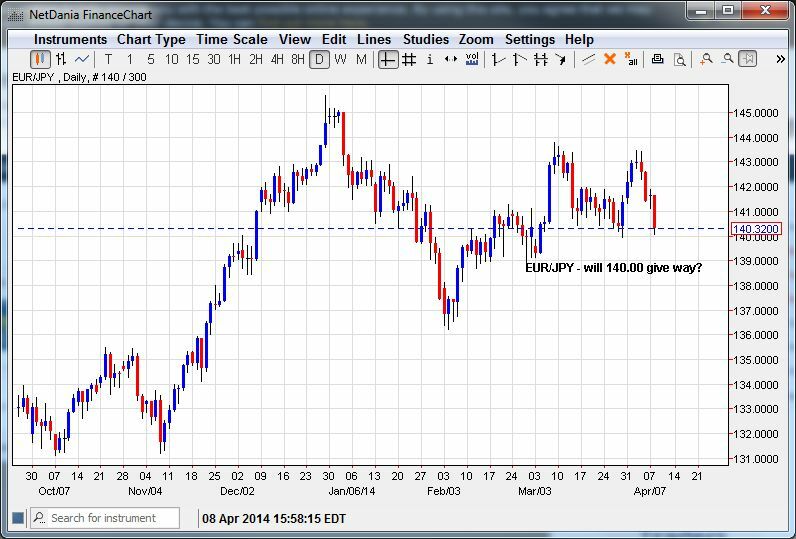 EUR/JPY – Will 140.00 Give Way? EUR/JPY has been pushed and pulled in opposite directions as euro has risen while USD/JPY has fallen in the wake of BOJ’s assertion that it will no expand monetary policy anytime soon. The pressure on USD/JPY may continue especially if global equities continue to correct, but the short covering rally in euro may soon run out of gas and help push the pair lower. The euro has been remarkably resilient as the unit bounced more than 100 points off the post NFP lows on the back of comments from ECB officials that they are not going to pursue any unconventional policies just yet. But if the economic situation in the EZ does not improve soon policymakers may have no choice. Another reason for euro strength has been its current account position as the massive trade surplus generated by Germany has helped to prop up the pair. Tonight’s trade surplus therefore could be key to euro’s near term prospects and if it misses its mark it could drag EUR/JPY down with it. EUR/JPY now faces a critical support level at the 140.00 level and a break there could bring a test of the 138.00 level as the pair collapses further. To the upside the pair faces resistance at the 142.00 figure and then at 144.00 as the lower highs weigh on the unit.